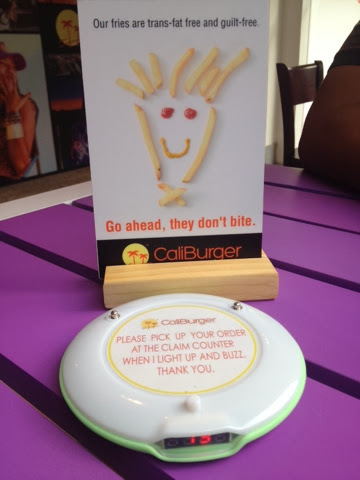 CaliBurger has finally landed in Philippines! I wanted to try it ASAP because of the drool-worthy instagram photos they've been posting. 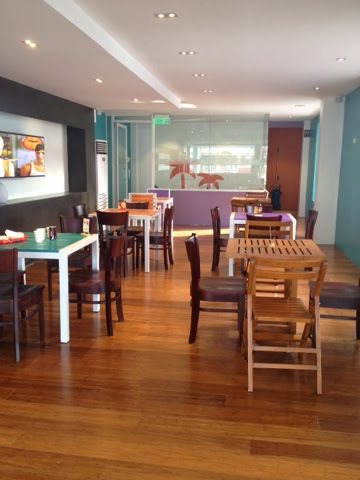 The Cheese, his friend Jam and I went to the CaliBurger Tomas Morato branch. The staff wears cute floral polos! Wait for the light and buzz to pick your orders. From second floor looking down. You will have the urge to run, jump and swim those turquoise water. Dang. 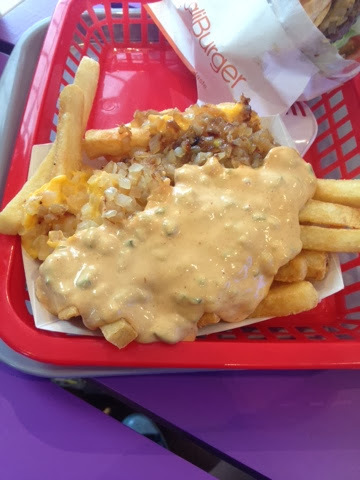 We ordered their regular Hamburger and wild style fries (you have to pay extra 100 to make your fries wild, a bit hefty in my opinion but no choice because I want to try what the fuzz is all about). While Jam ordered a regular burger also and Strawberry milkshake. 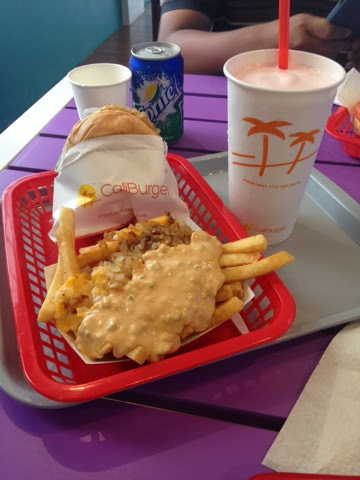 Honestly, there's nothing special with their burgers. 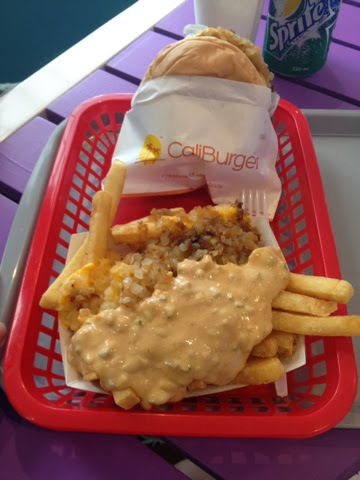 I'm not sure if the Cali Double has something special on it or the Chicken Cheeseburgers. It's not something you write home about. It tasted bland and lacks that certain oomph (not sure if it's cos they're on soft opening yet or what). For the same price (or even less), I can enjoy a more satisfying and good-tasting burger from other burger joints scattered in the metro (Snack Shack, Charlie's to name a few). 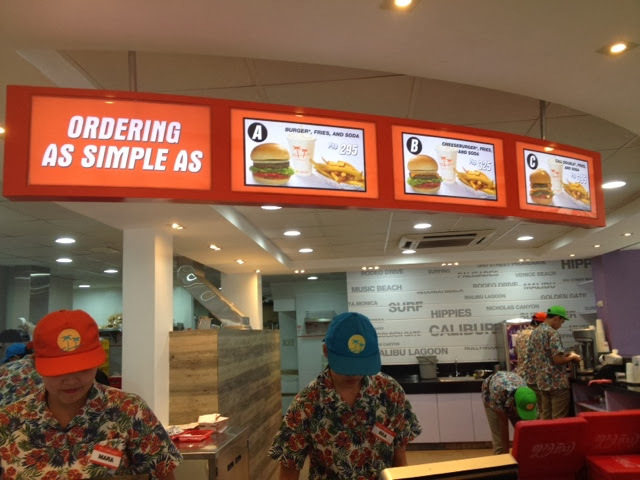 For sure CaliBurger will have a lot of other patrons, those who don't mind if their burgers are a bit on the bland side but I seriously do hope they improve this. 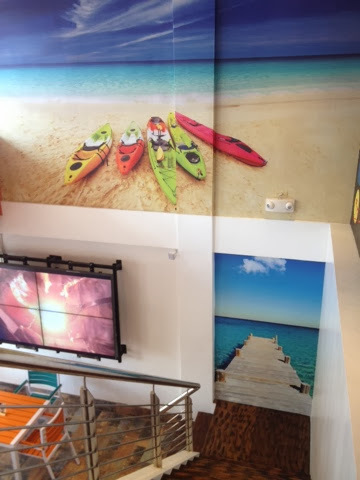 Personally, I don't think I'll have reason to come back for seconds unless they offer something new and really interesting stuff on their menu or if their wild style fries becomes less expensive hee. Note: This is part of the Malaysia and Singapore Series posts I'm doing. You can find the first part here. We arrived in Woodlands station at 6.30 in the morning, safely and without any mishap (thank goodness). Stepping into the immigration office, I was so conscious with my movements due mainly to numerous security cameras present in the building. You can't miss them. It's kinda scary. I've heard of many stories about how Singapore has very strict rules in almost everything and somehow, it was very effective because I was so scared for my own life I have no intention of committing whatever it is deemed illegal to do there. I'll be your obedient little third world tourist if that's what they're aiming for. When we passed the immigration section, I can't say that I was not relieved because I really really was relieved. We're over the first hurdle! We had a bit of problem though. The Cheese and I weren't able to exchange SG $$ in KL and we need to take the bus (and MRT too) but first we need to have $$. We were so happy to find a money changer just across Woodlands station that was already open! I'm sure the rate was pretty bad but we didn't have a choice. Besides, we only needed a small amount just to get us to our next destination. The Cheese also bought Bee Hoon supposedly as his breakfast but when we arrived at my friend Raymond's house, he and his wife ordered breakfast from McDonald's for everyone. We got on a bus that took us to MRT station. We were really amazed with how organized everything was thinking, so this is how it is in first world country! We were to alight at Yio Chu Kang station then take another (short) bus ride to Yishun. Our host, a college friend who now lives and work there with his wife, resides in Bulion Park. I'm so happy we didn't get lost hahaha. When we got to their place, we catched up for a while, had breakfast, and showered (finally!) before taking off again. 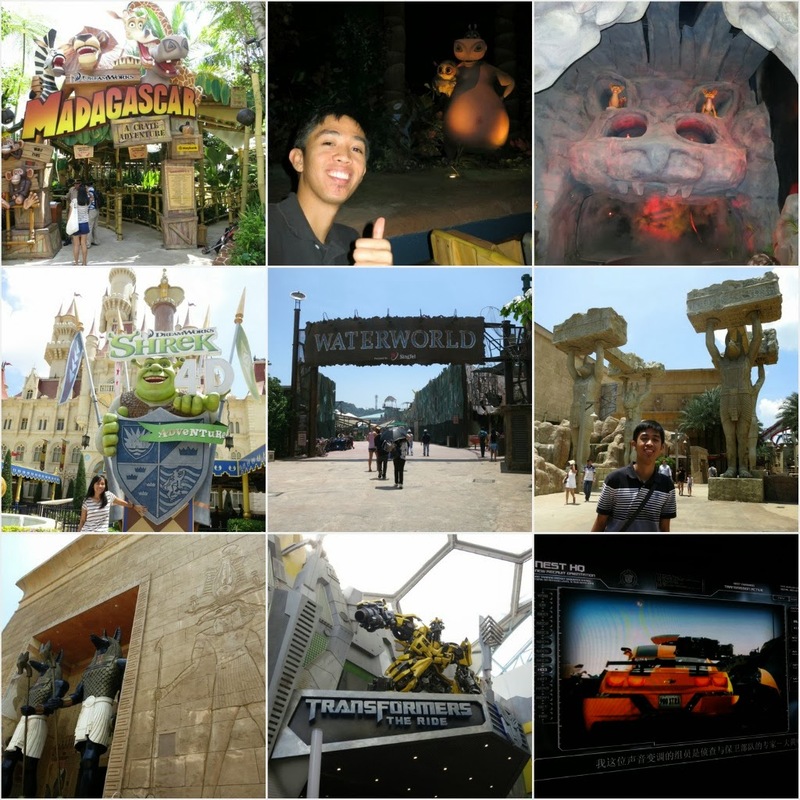 Day 2 was Universal Studios Singapore day. On our way back to the MRT station, we can't help but admire all the green things we were seeing, how clean the neighborhood was and the absence of kids loitering in the streets (they're all probably in school which is only right). We alighted at Harbourfront station, the last station in Circle Line. From Yio Chu Kang station, which is part of the North-South Line (red line), we switched to the yellow line after getting off Bishan station. No frills train-switching as it was pretty straightforward. I love Singapore's MRT lines I almost memorized it by heart when I came back the second time. There are many ways to get to Sentosa Island (where USS is located): by cable car (which is more expensive), by train (Sentosa Express which we took), by public buses or by foot (which I did with friends when I went back). 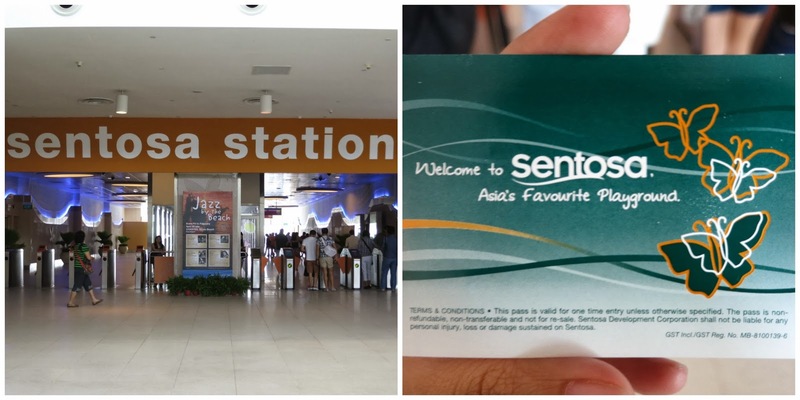 The Sentosa Express ticket costs $4 per person and is located at the 3rd level of VivoCity, you can't miss it. 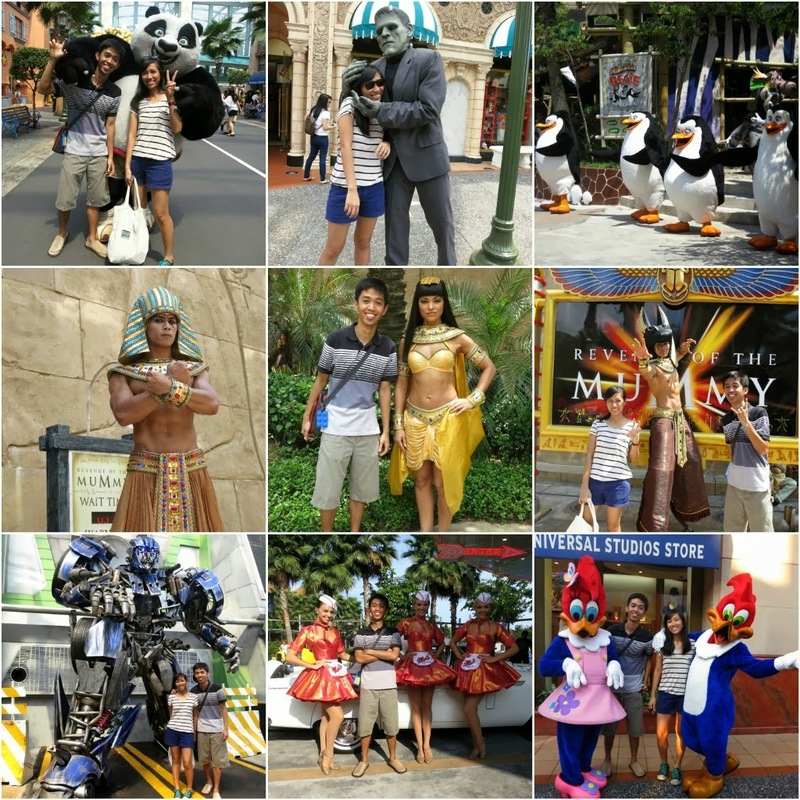 Our first USS ride was Madagascar :)) Pambata pala sya, nevertheless, I still had fun! Cute naman yung effects eh. Then we came by Shrek's place but had to go back at a later time to catch the show. We watched Waterworld show first before hopping on the Revenge of the Mummy ride. I had no idea whatsoever what to look forward to USS in terms of rides, I thought it was something in the league of HK Disneyland wherein Space Mountain is considered the most insane ride, but man, I did not see this one coming. We enjoyed the Mummy ride so much that if the line getting in wasn't that long we would've definitely have gone for seconds. Or thirds. After the fiery (literally) Mummy ride we came across Battlestar Galactica roller coaster which, in my observation, generated majority of the screams inside the theme park. KAYA NAMAN KASI PALA!! Since there's no queue, the Cheese and I shook our heads and muttered what the heck let's see what the fuzz is all about. The attendant strictly told us to leave our stuff first in the locker area before letting us in again. As in empty-your-pockets galore. Okay naman sya, parang nahihiwalay lang yung kaluluwa mo sa katawan mo. As in every other adult rides I've been in, this is definitely not for the fainthearted. When it was over, we got our stuff back from the locker then watched a bit of the action and took videos of it. It was when we realized there were actually two lines for Battlestar Galactica: human and cylon. We saw dangling feet which wasn't what we had a few minutes ago. As it turns out, Cylon is the more badass of the two. So what we did is put our stuff back again in the locker and line up again but this time in Cylon. I ABSOLUTELY LOVED THE COBRA ROLL AND VERTICAL LOOPS! I could take this ride forever kaso kawawa naman si JC, kakailanganin nya ng maraming bonamine hahaha. We were lucky because Transformers ride was already open for public when we came. This one's great as well although the line is really looong. I think it took us 45 minutes to get inside, strapped ourselves with belts and be chased by decepticons. But it was worth the wait naman. This was such a trippy ride, felt almost real too. After the Transformers ride, we watched some street dancers in front of the Palace showing their hip hop moves before noticing that most of them were actually fellow Pinoys! They do invite people to participate dancing and can really gather a crowd. Good job to those boys! These are collage of personalities we met inside the park. Although I was absolutely delighted to see and pose with Po, Frankenstein holds a special place in my heart after he smothered me in embrace with his huge hands hahaha. 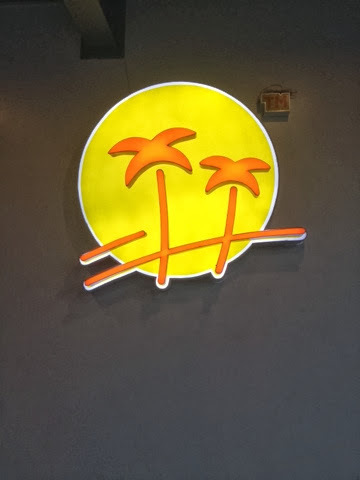 We had a really, really late lunch in one of the restaurants inside. Naghati na lang kami ni JC kasi mahalia fuentes! When we thought we've had enough, we finally exited USS. 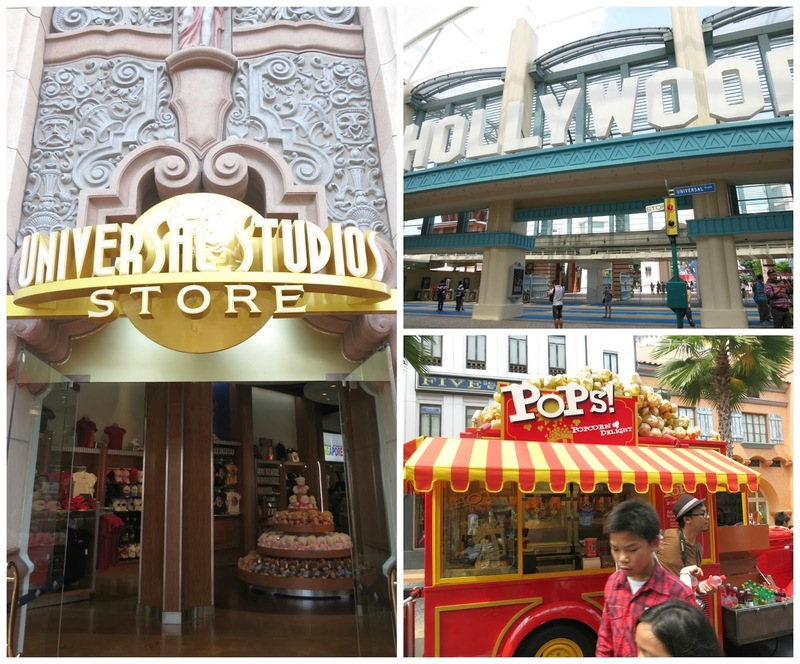 Outside USS, the place is sprinkled with various chocolates and sweet stores, anything that your kidult heart desires are there. 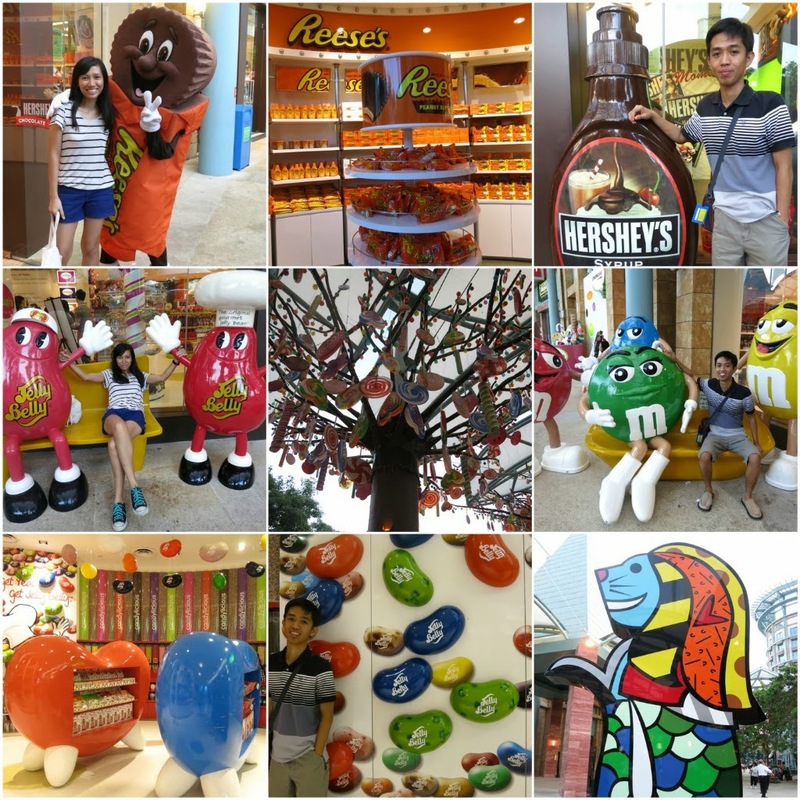 I wanted to buy and take home the entire Reese's store buti na lang di ko afford. We left Sentosa Island at around 7 and walked for a bit around VivoCity Boardwalk area, again, admiring how the Singaporeans turned those spaces into a thing of beauty. 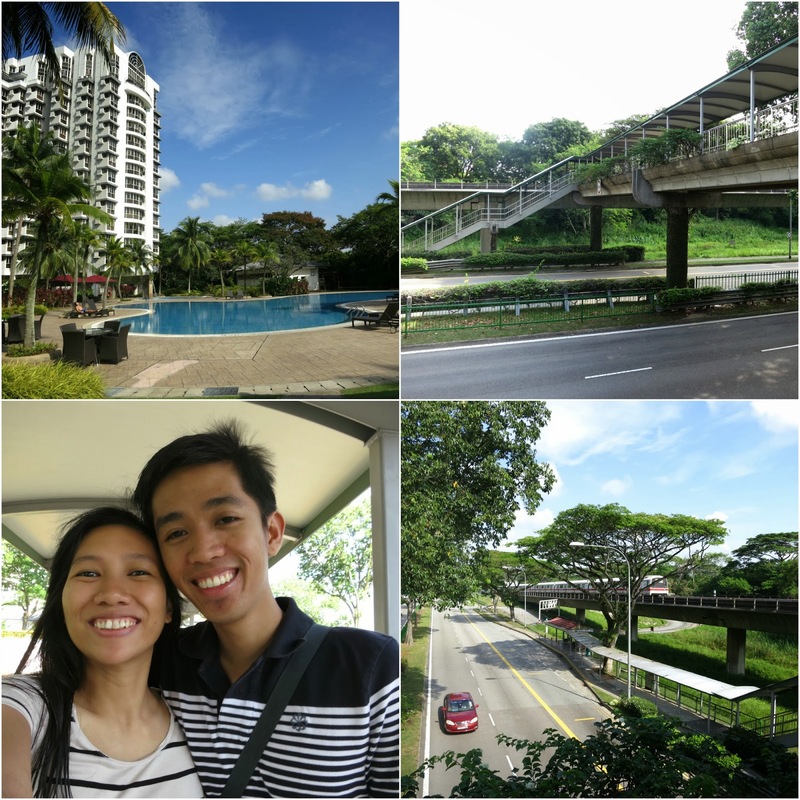 We rode the MRT to Dhoby Ghaut without really a particular place in mind to go to. All we know is we wanted to end up with the Merlion in sight. We passed by Raffles, crossed to Marina Square before ending up here! Perfect because we were already starving by that time. Upon reaching the end of the bridge, bought icecream sandwich from this manong. It was on my second visit to Singapore I've realized that the icecream sandwiches being sold near the Merlion are more expensive than anywhere else. Napaka-turista lang ng presyo! Unfortunately, we fell for it. Di bale, hindi ko naman na inulit. Is this the famous Merlion of Singapore? Eh bakit ang liit yata?! Joke lang. Medyo baba ka pa girl, andun ang totoong merlion na lumuluwa ng tubig pabalik sa ilog ng Singapore. We took so many "trick" shots but they were all too too funny so I'd rather not put them in here. As a closing photo, ito na lang. The Cheese trying to keep his eyes open kasi sleeping time nya na. We made sure to be at the MRT station at 11pm so we'll be home by midnight. That concludes our first day in Singapore, the second day of our KL - SG trip. 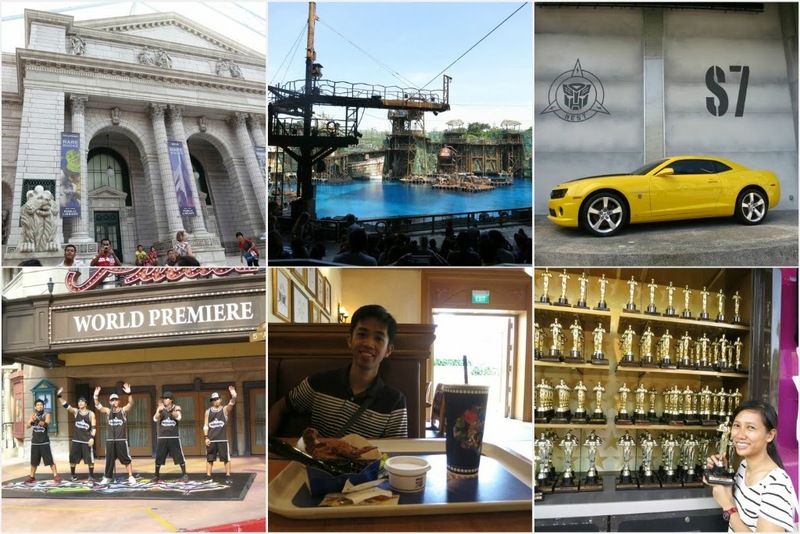 For a preview of our 2nd day in Singapore, there's this post - My Suka Stories from Our Recent Trip Abroad - I wrote right after our KL - SG trip. It was a very memorable moment in all of my traveling years and I think the title tells it all. Enjoy reading on my misery! One of my biggest regrets when I was in Singapore in 2012 was not watching Wicked due to time constraints. Standing in front of Sistic office, the Cheese and I were pondering how we'd get ourselves from USS to Grand Theater, Marina Bay Sands just so we can squeeze in Wicked in between but alas, I had to be practical. Akala ko sa Gershwin Theatre o Apollo Victoria Theatre ko na lang sya pwedeng mapanood but Bathala is good, as it turns out I didn't have to save and spend an exorbitant amount of moolah to have a short day in the Emerald City because WICKED CAME TO MANILA! Thank you sponsors for bringing Wicked here. Oz Dust Boutique in CCP did not sell Wicked socks which was fortunate on my pocket's part. Irrele photo just cos I like how we're looking I-don't-know-where haha. Promise, candid yan! People milling in CCP's lobby was abuzz with inexplicable excitement. We couldn't feign it either, our giddy faces and voices gave us away. "It's Galinda with a Ga."
The Clock of the Time Dragon does not tell the time rather tells people's secrets from their past and predicts their futures. “I’m the other daughter, Elphaba. I’m beautifully tragic.” hashtag nakarelate. Jemma Rix is AMAZING as Elphaba, she may have gone off-key at one of her songs but she more than made up for it with the rest of the songs. Suzie Mathers is a total doll. I love her and how she gave life to Galinda/Glinda's character. I enjoyed every second of Popular because of her! I'm extremely happy I got to experience the magic of Wicked. 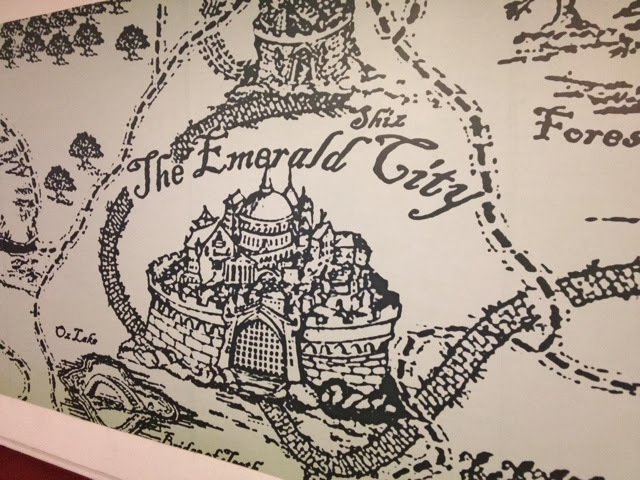 That we, Filipinos, don't need to fly to other countries just to have wickedly wonderful day in the Emerald City. Mostly I'm thankful of that fact. So go ahead, Wicked shows have been added in Manila until March, CATCH IT!